Award-winning journalist-blogger Prune Antoine - who had the guts to show up in jeans for her award ceremony at the Quai d'Orsay (yeah!!!) 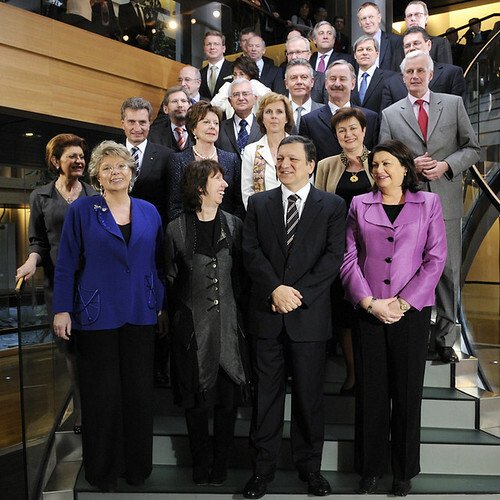 - is publishing a wonderful series of interviews with female EU Commissioners on her blog. So far, Connie Hedegaard, Maria Damanaki, Neeli Kroes, Máire Geoghegan and Viviane Reding have answered the same questions about how "macho" they find the EU institutions, how the fact that they are women influences their work and how they would like to change the EU. If you haven't read the interviews yet - now is the time! Sorry to dampen your enthusiasm, but is it really a progressive choice to focus on their role as women, instead of the important jobs they are doing? For me, these interviews have felt more like lost opportunities. No, I don't think so, (1) because their answers are quite different and (2) because they are still role-models in a political world dominated by men.